Ten promising film makers and digital content creators demonstrated their ‘DRIVE’ to secure places as finalists at the 12th installation of Malaysia’s most established and longest-running short film competition. 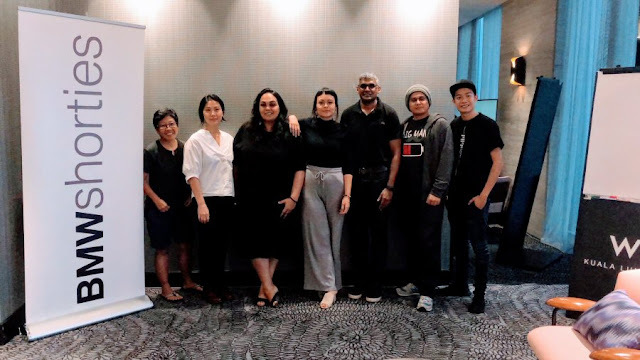 The BMW Shorties, Malaysia's most prestigious and longest-running short film competition has selected its Top 10 Finalists from a talented pool of aspiring Malaysian film makers and digital content creators. The finalists are also in the running to win BMW Shorties 2018 People's Choice Award, which will be open to public voting starting from 22nd November to 7th December 2018. Sashi Ambi, Head of Corporate Communications of BMW Group Malaysia said, "Since its creation, the BMW Shorties has been one of the most successful platforms in Malaysia for aspiring local filmmakers and digital content creators to share their artistic visions on Malaysian-made stories. This year, we are delighted to witness yet another pool of refreshing talent showcasing their passion for the art of film making and the creation of digital content, with our group of finalists representing the finest of such promise and potential." Now in its 12th year, the BMW Shorties challenged the film makers and digital content creators with the theme "DRIVE". To have Drive is to be relentless in achieving a goal. This urge is innate and motivated by more than passion. It takes ambition. The line-up of judges presiding over this year's competition consists of top names in the local filmmaking industry, namely the BMW Shorties veteran judge and commercial filmmaker, Lina Tan; multiple award-winning filmmaker, Isazaly Mohd Isa; filmmaker and screenwriter, Nadira Ilana; award-winning filmmaker Tan Chui Mui; and rising storyteller and award-winning filmmaker, Quek Shio Chuan. Lina Tan commented, "I am once again impressed by the sheer breadth and depth of the submissions this year. The film makers engaged with the theme 'DRIVE' through such diverse approaches. The BMW Shorties has once again brought out the best in these filmmaking talents, spurring them to push the envelope and realise their creative visions." Tan Chui Mui, meanwhile, said, "The heart and human elements are always key things we look for in a short film and this year's submissions have inspired me in that regard. I look forward to watching more of these talented filmmakers and their works in the future." Quek Shio Chuan, who is a BMW Shorties alumnus himself, said, "It is encouraging to see such quality and calibre in Malaysia's current batch of up-and-coming filmmakers. There are indeed strong contenders who show remarkable potential in the handling of the genre and treatment of the theme, which made our job as judges a tough one." The BMW Shorties Grand Prize Winner will win a production grant of RM 80,000. Other accolades that will be awarded include Best Director, Best Actor, Best Actress, Best Screenplay, Best Cinematography, Best Production Design, Best Editing and Best Sound Design as well as the ever-popular People's Choice Award. The BMW Shorties 2018 Top 10 Finalists short films are now available for viewing and voting on the BMW Shorties website. Members of the public are invited to vote for their desired People's Choice Award winner from 22nd November to 7th December 2018. BMW Shorties 2018 award winners will be crowned at the BMW Shorties Film Festival, happening on 15th December 2018 at Tiffin Food Court located at 15, Jalan 13/6, Seksyen 13, 46200 Petaling Jaya, Selangor.